Team Cipher256 from Makerere University, Kampala Uganda which is behind WinSenga has made it to the grant finalists of Imagine Cup 2012. Its is among 13 teams selected as finalists and among the only two teams to make it from Africa. The other team from Africa is Vivid from Cairo,Egypt. In its second year, the Imagine Cup grants is a three-year, $3 million competitive program which enables Imagine Cup participants to take their innovative projects to market as the next step in their business development. Imagine Cup and the grants are part of Microsoft’s YouthSpark program, which is the company’s commitment to reach 300 million youths in the next 3 years through technology, training, and experiences that empower them to imagine and realize their full potential. Last year, students from Croatia, Ecuador, Jordan and the United States won the grants and received funding and other support in the first year of the grants program. The 13 teams selected as finalists received the highest marks based on a combination of criteria: impact & viability, team quality & motivation, solution design & motivation and problem definition. The winning grant applicants will be announced in December 2012 at the Social Innovation Summit in the Silicon Valley, and awarded with a grant package in the form of cash, software, resources and other on the ground support to help them establish a nonprofit or for-profit organization to bring their idea to reality. 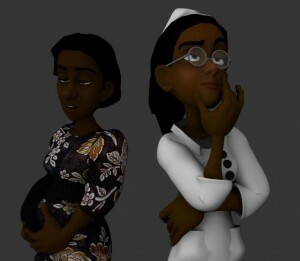 WinSenga is an affordable mobile antenatal diagnosis solution implemented via a Window Phone. It comprises a modified Pinard Horn to which microphone is attached to detect and pick sounds which it feeds into the application. From this the application enables diagnosis to be carried out. The antenatal diagnosis is hence made timely, effective and most importantly, affordable. It can be used by medical personnel as well as expectant mothers, thus empowering them to monitor their pregnancies. WinSenga is also used to generate real-time statistical information on trends like Fetal Heart Rate (FHR) during labor, effectively substituting and/or complimenting the partograph.